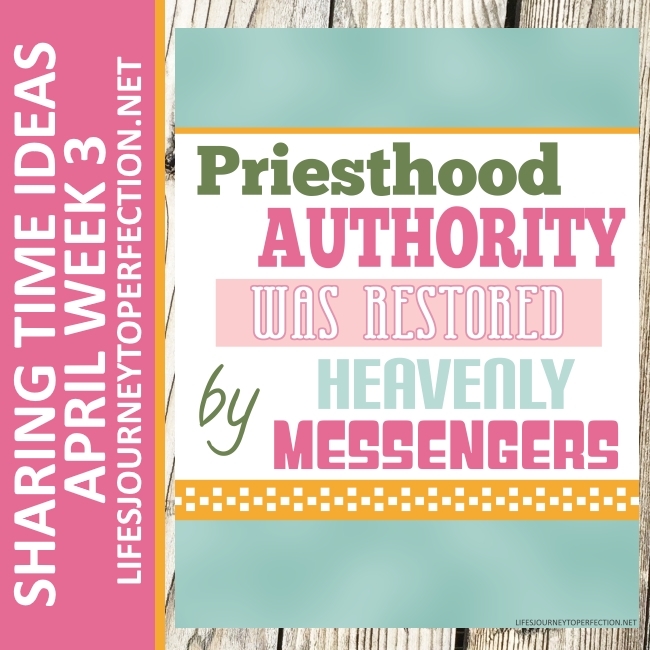 Life's Journey To Perfection: 2018 Primary Sharing Time Ideas for April Week 3: Priesthood authority was restored by heavenly messengers. 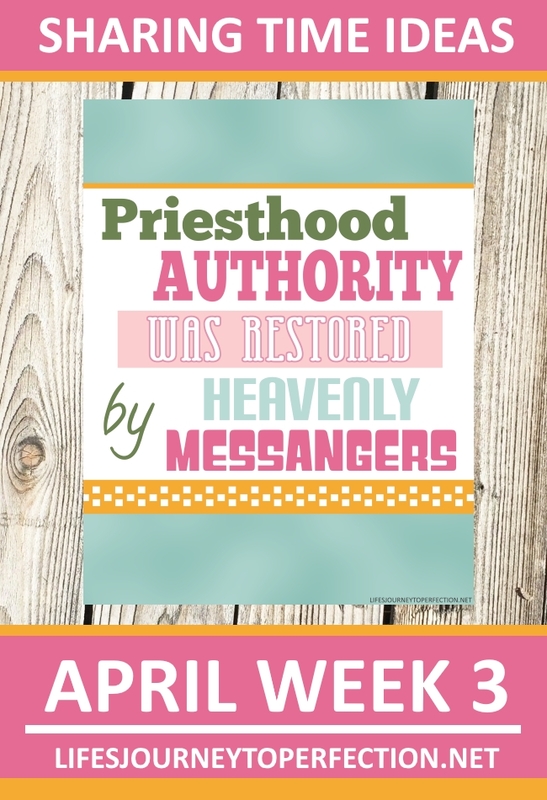 2018 Primary Sharing Time Ideas for April Week 3: Priesthood authority was restored by heavenly messengers. 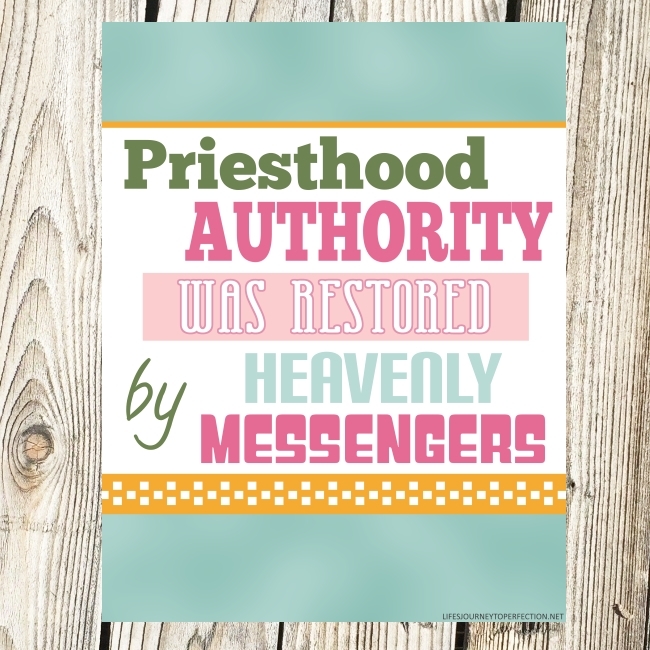 April Week 3 Topic: Priesthood authority was restored by heavenly messengers. Play the song, "The Priesthood is Restored". Before playing the song invite the primary children to listen carefully and raise their hands when they think they know what this week's sharing time lesson is about. When the song is finished invite the primary children to tell you what they think the lesson is. Show the primary children the week's theme poster and invite them to repeat, "Priesthood authority was restored by heavenly messengers." Discuss with the primary children what the word restored means. Explain that when Jesus was on the earth and he organized his church, their was priesthood authority. After Jesus and his apostles died, the priesthood authority was taken away from the earth. Today, we will learn how priesthood authority was restored to the earth, through to Prophet Joseph Smith, by heavenly messengers. Place on the board the pictures of the restoration of the Aaronic Priesthood and the restoration of the Melchizedek priesthood. On the board around the pictures randomly place the word strips of the blessings of the priesthood (see free download below). Two options... You can either invite a Aaronic Priesthood holder and Melchizedek priesthood holder to come and speak about the restoration of the respective priesthoods as suggested in the outline. Or you can invite a primary child to come up and hold the Aaronic Priesthood picture and then you could, read or retell Joseph Smith—History 1:68–72. Then invite another child to come up and hold the Melchizedek priesthood picture and read, D&C 27:12–13. After the pictures have been discussed place the pictures back on the board and explain to the primary children the importance of priesthood authority being restored to the earth. Explain that we receive ordinances and blessings, some of which are essential to our exaltation, because the priesthood has been restored. Further explain that the blessings of the priesthood are available to all of God's children. 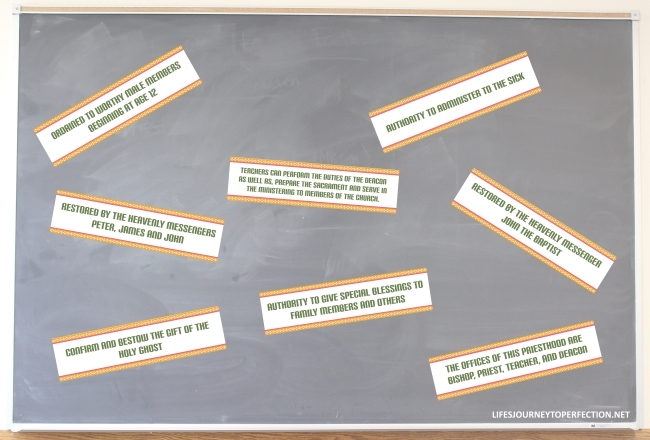 For the activity... explain to the primary children that randomly on the board are some of the blessings and ordinances we receive through the priesthood, also some facts about the priesthoods. For the activity a primary child will come up and pick one of the word strips, they will then decide whether this blessing comes through the authority of the Melchizedek priesthood or the Aaronic priesthood. They will then put the word strip underneath the picture that it goes with. Discuss the blessing or ordinance with the primary children. Continue inviting a children to come up, until all word strips have been placed correctly. Invite the primary children to raise their hands if they have been blessed because of the restoration of the priesthood. Explain that each of us are blessed because of priesthood authority. We are able to gather each Sunday and partake of the sacrament, this is just one way that we are each blessed. Close by sharing your testimony of the restoration of priesthood authority. - Teachers can perform the duties of the deacon as well as, prepare the sacrament and serve in the ministering to members of the church. -Priests can perform the duties of deacons and teachers as well as, bless the sacrament, baptize, and ordain others to the offices of priest, teacher, and deacon. - The offices of the this Priesthood are Apostle, Seventy, patriarch, high priest, and elder. Thank you SOOO much for creating this great outline and sharing it with us! I will definitely be using it next week! Thank you! This was very helpful in preparing my lesson. Thank you for sharing! You are an angel! I sure love all the ideas you post on here; thanks SO much for all your hard work and all that you do in order to allow us more creative ways to teach. I could never come up with so many great things every month!! I can't tell you enough how I appreciate your generous and talented spirit. This is so helpful teaching these precious primary children in Nepal. I have the blessing of serving a mission here in Kathmandu. They are such infants in the Gospel and this is so helpful and for you to be so generous and with free downloads it is such a blessing! THANK YOU FOR SHARING! Thank you so much! You're not only blessing the lives of your own primary children, but ours too. And mine too, by saving me so much time!! Love your ideas! !